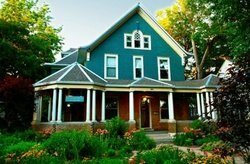 This charming bed and breakfast is located in the heart of historic downtown Manhattan, on the northern edge of the Flint Hills. Plenty of unique dining, shopping and cultural experiences are located within walking distance. Each of The Morning Star's five corner guest suites features private baths with two person Jacuzzis. A full breakfast is served each morning and the house specialty, stuffed french toast (drizzled with dark chocolate!) is sure to satisfy those cravings. The innkeepers are happy to help you create a special babymoon getaway with custom gift baskets and other amenities. Search our one day babymoons in Kansas for relaxing pregnancy massage and prenatal spa treatments.